"Cognitive Science Meets Artificial Intelligence: Human and Artificial Agents in Interactive Contexts"
Many MindModeling researchers were both presenting their research and interacting with other cognitive scientists from all other the world at this event. You can visit Cognitive Science Society's website here: http://cognitivesciencesociety.org/conference2014/index.html. In addition to attendance from several researchers in our lab, cognitive scientists from all other the world get together to their latest theories and data. You can visit their website here: http://cognitivesciencesociety.org/conference2013/index.html. Previous years proceedings are also available from links under the Science tab in the MindModeling navigation bar. Also, the project will be pushing out a new feature soon which captures the average model runtime for each job to more precisely target workunits to one hour (specifically for tasks with variable runtimes). This is currently in the testing phase. -Ongoing development of infrastructure controlled sampling to allow researchers to specify how much each individual parameter set should be sampled and aggregated before accepting. Please let us know if you have any thoughts, requests, or questions! And thanks again! If you've been tracking the development of jobs from the progress bars on our homepage, you may have noticed that recent jobs are finishing much sooner than expected. This is due to the introduction of intelligent search algorithms to our server-side software. These algorithms allow us to find an optimal solution for a model without having to fully enumerate and compute every node in a job's parameter space. Once a solution is determined to be optimal, or optimal enough, the job terminates. These methods greatly speed up the cycle of generation, computation, and evaluation of models. Our view is that it is only through the combined use of intelligent search and distributed computing can we meet our far-term scientific and technological objectives, both as a research team and as a broader research community. While in time we will introduce better indicators of progress, for now simply understand that the progress bars are not always a guarantee of work for the foreseeable future. The MindModeling server software has recently undergone new upgrades to support more platforms and languages and increase the efficiency of our work unit creation logic. We now have a total of four unique client applications which allow our cognitive modelers to develop in multiple languages, such as Lisp, Python, and [R], plus near completion of adding Java support. This means that we will be able to support a larger community of researchers, and more work in the future. Also, to enhance the utility of the MindModeling system to cognitive modelers and ensure the most efficient use of volunteer resources, we have integrated a new genetic algorithm optimization method to control work unit projection in the system. We should have plenty of work over the next couple of days while we run optimizations on some our models across different data sets. This week recorded our top 7 best crunching days in MM history. In that time there were 9 completed cognitive model explorations and our latest version of the very large 'Change Signal' job is now 25% of the way complete. Thanks Everyone -- Let's keep crunching! - L'Alliance Francophone crunching strong and in the lead with 163k RAC. A new DSST model was run last friday. It would have taken over 4 years on a single computer. Thanks to all the added power it took less than 13 hours. That is a 2,746 times speed up -- amazing. The team L'Alliance Francophone just took first position in the team standings today and has just announced their intentions to really show their strength. They are planning on staging a credit 'Race' from 21 September to 7 October 2012 where they will dedicate their team's full power to MindModeling@Home computational research. We are very excited about the contribution L'Alliance Francophone has brought (and will be bringing) to MindModeling@Home. Thanks to Ousermaatre for organizing this and good crunching to all! Native Python-based model support (version 2.7) added as an new distributed application. An experimental testing job is now running under the very original name 'Python'. This capability was added to support a wider range of cognitive researchers and to expand the science being explored using MindModeling. Other languages are planned to become supported in the near future including [R] and Java as well a Python 2.6 and Python 3.2. Also, a new mirror download site was added at Wright State to better support this addition and the bandwidth demands that come with supporting multiple applications. 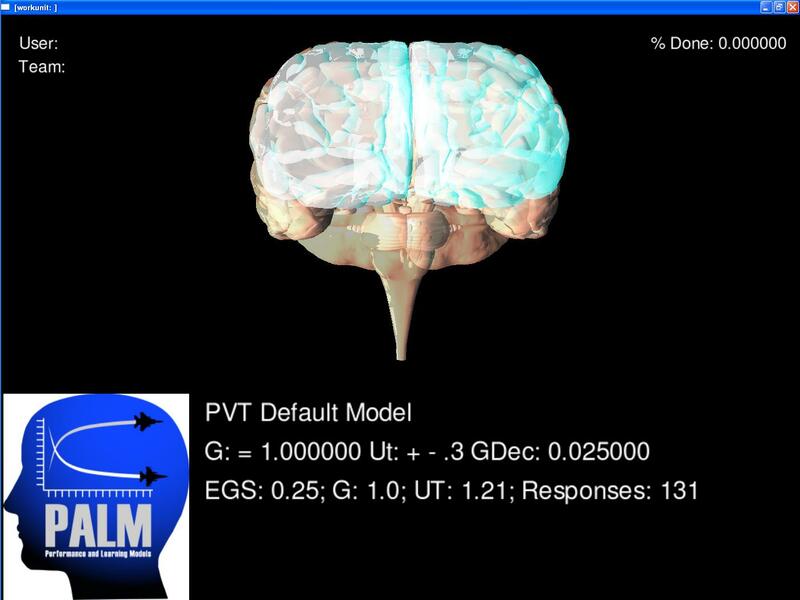 Next week the team will be presenting a demonstration of the MindModeling@Home system at the 21st Annual Conference on Behavior Representation in Modeling Simulation as we illustrate the power volunteer computing can provide cognitive science community. Also, a few months ago I returned from graduate school after finish my dissertation focusing on the 'Automated Cognitive Model Evaluation'. Since January, I have been working full-time with the team focusing on some of the issues for make MindModeling@Home a more useful resource for a larger pool of cognitive modelers. Thanks for all your support to the project and it's good to be back! A small set of workunits was distributed to a handful of volunteers this afternoon, and we'd like to thank you for your computations. Another small job may shortly follow. We're currently in the phase of migration and refactoring. The migration is nearly complete, but there is still much work to be done for refactoring the system. As such, the flow of WUs and jobs will not be continuous until the new system is rolled-out. We greatly appreciate everyone sticking with the project, and the contributions to the current running model, as well as the many models in the past, has helped out our lab immensely. As it has been several monthes since my last news post, I will attempt to address some of the growing concerns relating to the current state of this project. On the development side, the team is working hard to expand our IT infrastructure and implement new technologies that will allow for a more reliable and robust system. We're also taking great strides to develop a new backend portal for our modelers to make our project easier-to-use and include more features. What does this mean for our volunteers? A more reliable system with quicker debug times and plenty of available work. What does this mean for our project? Advances in cognitive modeling at a much faster pace and grander scale than ever before. Unfortunately, there is also some bad news. We are currently unable to host our MidModeling servers under the same agreement that we've been operating, and we will need to find a new home. We've got several options under way and should be hosting/serving MindModeling.org again sometime in early 2010. It is a setback, but it has also given us the time to make some necessary changess to our code and underlying architecture. Thanks for all your contributions and patience while we go through this period of readjustment. While our researchers are preparing new models to run on MindModeling.org, the MM team has decided to take some time to update and make improvements to the website. Part of this is the inclusion of a Mind Modeling banner that can be displayed at the top of our main webpage. Instead of simply making the banner ourselves, we decided to open up the design to all of our volunteers and hold a contest to select the best design. The banners will be voted on by the MindModeling team, and the winner will get to see their work displayed on MindModeling.org for at least the next year. We will keep the contest open until the end of July, 2009. Please submit all entries to our forum here: Banner Contest 2009 or via email. If there are any questions or concerns, please let me know through email. Hi folks, MindModeling.org will be experiencing updates over the next couple days which may result in the server being shut down for extended periods of time. Please be patient and we will provide as much information as possible in regards to the status of the site. There was a quick disconnect this afternoon between our database server and MySQL. The system is rebooting the data right now, and everything should appear normal again in just a few hours. New Job! SASTNM_10 is ready for some heavy crunching! We've got a new job in the system, SASTNM_10, and it's big one; it should provide crunching for at least several weeks. There are some quirks to it though. Because it's such a large space, and becuase we're running 100 sample of the same parameter set, this job only includes one parameter set per WU. What does this mean for crunchers? Well, since our 'percent complete' calculation is based off the completion of the first paramter set, having only one parameter set per WU is going to throw our calculation off a bit. This isn't something we haven't seen before, but it can be misleading sometimes. Just know that each workunit will start off at around 90% complete, but will work for about 10-15 minutes before completing. If there are any other issues we will address them as they come up, but feel free to let me know via email or the message boards. And as always, Happy crunching! After many hours, and hard crunching, we've completed two of our largest tasks ever (1,500,00 nodes)!! SASTNM_9_9 completed over a week ago, and it's sister job, SASTNM_9_7, will complete in a short period of time (it's currently 99.93% complete). Thanks to all the volunteers for continuing to aid us in our mind modeling efforts, and greatly furthering our research goals. Your contributions are extremely appreciated. In the next couple of days we'll be adding a whole new set of jobs to crunch (the SASTNM_10 family), so get ready for some heavy crunching. And as always, email me or post to our bulletin if you have an questions. for a day or so. We'll keep you posted of the progress. Happy New Year's Eve! Kicking off 2009 we have a brand new job for our mind modeling research. Enjoy! We look forward to the new year and your continued participation! Our holiday maintenance is complete! We thank you for your patience, and we appreciate everyone's help on this project over the last year. Have fun and be safe over the holidays! MindModeling.org will be down periodically over the next week for routine maintenence. We appreciate your patience. We're currently updating our Boinc software, so all current jobs will be paused over the weekend. We anticipate crunching SSAT and PVTNM again by Monday. Additonally, the Work Units for SSATNM_8 will display an incorrect percent complete while crunching numbers. For instance, the percent complete total will immediately jump to 95% and then linger there for an extended period of time before the WU actually finishes. This is specific to the model, it relates to our research, and it should just be ignored. Sorry if it causes some confusion. 3.4 is now out. Documentation will be added to the message boards later this evening. 3.4 removes the needs for patches to any platform's application in order to cruch MM@Home workunits. All the database's tables that were corrupted by our storage system's filesystem corruption have been rebuilt. The system is NOW online again -- (and much more stable). It is nice to be able to reboot your server and the RAID array doesn't just disappear. Upgrading our storage solution was successful. Final reconfigurations are underway and should be completed this weekend. Our storage solution has still been having intermittent problems. We are bring down the system today and will be doing a full reload of this system over the weekend. Sorry for the inconvenience. It appears our database became to large and was unable to query the massive amounts of result files we were generating. As a solution, we've reallocated the old result files to a new location. This has allowed our data to flow back to the server again and work properly. If problems continue to persist, please send a private message to me via the message boards. Monsoon season got us -- we had a power outage last night that caused some problem with our storage system. A new DB server has been installed and the databases were ported over to the device (The site was down for 45 mins while this occured). To quote Woodrow Wilson 'I not only use all the brains that I have, but all that I can borrow.' Thank you all for letting us borrow your CPUs for our brains. The PC Perspective Killer Frogs Team has become the first team to crunch over half a MILLION total credits for MindModeling@Home - Congratulations and Thank You Who Will Be Next? (BOINC Synergy?, AFRL?, PALM?) Who will be first to break a MILLION? Site temporarily down while we upgrade to the lastest verion of BOINC. The credit system has been fixed [darwin now requests credit:)]. There are still issues with the Winx64 and Tiger releases, but these should be resolved soon. All stats sites are welcome to post MindModeling@Home (beta) data. A lot has happened the week to prepare the beta web site for release. A new logo has been add along with an associated favicon for the browser.